– YELLOW = Proposed classes/events. These could be changed to a different date, different class, or sometimes even a different location. Email us! – BLANK = More available dates Email us! As always, if you’re looking for a class in your location or on your teams’ specific dates, please email us to request we put it on the schedule. STUDENT REGISTRATIONS AT GUE.COM DO NOT REFLECT CLASS SEATS AVAILABLE. Please email us to inquire about remaining seats in your desired class. Thanks! 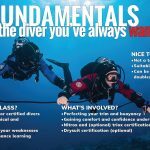 This entry was posted in Education and tagged Fundamentals, fundies, GUE, Mer, quarry tour, training. Bookmark the permalink.